Holiday entertaining just doesn’t have to be that hard. When I was a kid, my parents and their friends would take turns hosting everyone for a big Christmas supper. Not a five-course gourmet meal. Nothing that required mail-order ingredients. Just something good and simple and fun. Like a huge pot of chili. A big pan of lasagna. Stacks of pancakes surrounded by every topping we could find at Kroger. And a pan of brownies. 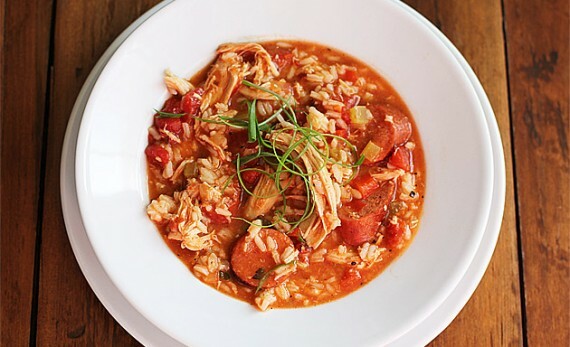 This Chicken and Sausage Gumbo reminds me of those suppers. It’s delicious and belly-warming, but not fussy. A big pot of stew, brimming with shredded chicken, sliced andouille, rice, celery, red bell pepper, onion and tomatoes. The night I made it, we planned to either freeze part of the gumbo or share it, but then we each had a bowl. And we did the same thing the next night – and the next – until it was gone. Next time, we’ll have to remember the brownies. If you don’t do spicy, skip the sausage and add 1 pound of shrimp (peeled and deveined) with the shredded chicken. Cook until the shrimp are opaque in the center, 3 to 5 minutes. In a heavy pot, heat the oil until shimmering. Add the chicken, skin side down, and cook over moderately high heat until browned on the bottom, 4 minutes; turn over and cook until browned on the second side, 4 minutes. Transfer to a plate and discard the skin. In the same pan, brown the sausages over moderately high heat, 4 minutes. Transfer to the plate with the chicken. Pour off all but 1 tablespoon of the fat from the pot. Add the celery, bell pepper and onion and cook over moderate heat until lightly browned, 10 minutes. Stir in the flour and the tomato paste and cook, stirring, until the flour smells nutty, about 3 minutes. Transfer the chicken and sausages to a cutting board. Shred the chicken into bite-size pieces. Slice the sausages into 1/2-inch-thick rounds. Return both to the pot, and stir in the scallions and rice. Simmer until heated through, 1 minute. Season with salt and pepper and serve with Tabasco.